conscientious student in his sometimes impatient quest for this knowledge. having been told by Cal's son Kenny that the teacher wanted to see him. After catching him in a trap, they then led Rafe into a barn at gunpoint. table and cried, and Rafe sat beside Kenny and patted him comfortingly. told the Virginian that Rafe's mother must have loved his father very much. him but notes it wasn't necessary for him to have made a special trip. the foreman tells him there is a lot of fence down on the North Fork. hour.I'm going to the dance--with the teacher." ignorant of that fact, "Well, you never told me, I'm sorry. Don't worry. Virginian takes advantage of the tub of hot water for his own bath. Shiloh tonight." She inquires with concern, "He's not hurt, is he"? some fence. It was an emergency." But she needn't be "inconvenienced"
husband), "That's very kind, but I've had a raging head ache all day. 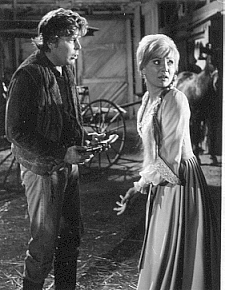 Susan Oliver also guest stars in 6.14 "A Small Taste of Justice,"
7.09 "The Storm Gate," and 9.13 "Hannah"
Albert Salmi may also be seen in 1.10 "It Tolls for Thee,"
2.07 "Brother Thaddeus," and 6.16 "The Death Wagon"